Well, the bad weather they said was coming didn't come. It did get extremely cold. there was a lot less traffic than usual, so getting to work the past few days has been better than usual. Tomorrow is Friday, and pay day! I got extra cash for my birthday, so I can take less out of my paycheck than usual, and put it towards the new car purchase. My commute yesterday was a breeze because every sane person stayed home. At least I get a good spot in the (unheated) parking ramp on days like this. Currently minus 28F, up a degree from when I got up an hour ago. Predicted high is -13. I have Denver's weather on my phone and notice temps there this week are going to be in the high 40s and 50s. I also have New York, and it looks like you'll be above freezing today and in the 50s by early next week. Yes, I saw the temps for the coming week, up to the 50s again! I'm waiting for when it drops down again, and hopefully we get snow. I'd like one nice snowstorm before the end of winter. I was never a big football fan, and I am not particularly interested in the halftime show this year, so I'm watching the Reelz network, and their marathon of a series called "World's Most Evil Killers". Pretty quiet weekend overall, did the online shopping on Friday, picked up groceries on Saturday, and did the laundry and cleaning today. I did have a shopping spree at Omaha Steaks on Saturday. When my friends threw me the party at their house, I specified "no gifts". Tina, however, knew I shopped at Omaha Steaks occasionally, so she took an Omaha Steak box, cut a hole in it, and titled it the "Omaha Steaks Bank" and people could put whatever donations they wanted into it, and any money collected by me would be used at my next shopping trip. The total ended up being $150.00! 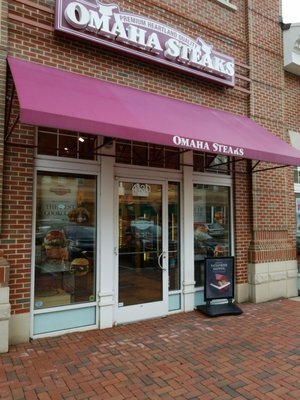 Today I went to Omaha Steaks, and usually end up with 5 boxes of stuff. Turns out this weekend was a half-price sale. I came home with 11 boxes of stuff. I got: Chicken Fried Steak, Ground Beef Burgers, Chicken Cordon Bleu, Seasoned Pulled Pork, Sweet & Spicy Shrimp, Maine Lobster Ravioli, Shrimp Fettuccine Alfredo, Seasoned Steak Fries, Boneless Pork Loin Chops, Tomato Jam (to top the burgers) and Chocolate Mousse Caramel Cups. Me neither. For me it was Victoria on Masterpiece. Not good history but your typically good Brit costume drama. I was never a big football fan, and I am not particularly interested in the halftime show this year. Me neither. After Victoria was over (10 p.m. EST), I checked, and, as I expected, the game was still going on. The final result didn't surprise me. I've never given a hoot for the commercials or the halftime show, not even when there is a wardrobe malfunction. I had an e-mail from a friend, who said he thought Tom Brady was "overexposed." I replied that Tom Brady could expose himself to ... oh, never mind! Wait. They have brick-and-mortar stores? I did not know that. I've gotten steaks from them with "points" I get at work, but that's mail order. Last month I got a dozen hamburgers. Grilled, they're a little dry for me, so after I cook them, I soak them in a pan of beef gravy and eat them as "chopped steak." Yikes! I hope you have a big freezer! Here we are, another week has started. Work went really well today, I was able to get everything done, and leave on time. It felt good to get home and have a clean apartment. Not necessarily a big freezer, but I had enough room for everything. I ended up on the Reelz network, watching a marathon of "World's Most Evil Killers". Yup, they do have brick-and-mortar stores. If you go to their website and search on your zip code, it will tell you the nearest store. It was a quiet day at work, and I am very glad for that! I got a new title at work today, and from what I understand, a bonus is coming, as well as a raise with the new title. There may be a merit increase as well. We'll see. I won't get my hopes up! LOL You know how the corporate world is. The new look here is going to take a little getting used to! LOL I feel like it's a completely different place! Well, the weekend with me has been a little crazy. I got home on Friday and plotted out what I needed to get done. I had known that dad was fine, but mom had been dealing with a lingering case of bronchitis. Me: (answers phone) Hey Chris. Chris: I'm calling because I have to vent. Chris: I came home to an empty house. There was a note that mom and dad that mom went to an medi-center, as her cough wouldn't stop. She wanted some meds to make the cough stop. Chris: I had just reheated my dinner, and the phone rang. It was the medi-center calling for mom and dad. Apparently mom got examined, and she and dad just left, thinking the consultation was over. They were calling to tell me that mom has pneumonia, and they want to give her prescriptions, but when they went to talk to her, she was gone. Chris: Yup, just walked out, with no prescriptions. That's not the best part! Chris: I called their cell, to tell them to go back to the medi-center. They're not getting the call, because the phone is on the dining room table. Chris: I'll call you back with an update, when I have one. I hang up and get online.....trying to think if there is something I can do. About 10 minute later, Chris calls me back. Chris: Ok, they are back on their way to the medi-center. Dad is a creature of habit. I know what medi-center they went to, so I started to drive to it, knowing the way dad would drive home. On the way, I saw dad's car in the CVS (drug store) parking lot. I pulled in, and found them looking for cough medicine. I gave them their phone, and told them to go back to the medi-center. They're on their way now to get mom's prescriptions. Me: Why did they leave in the first place? Chris: It was what the woman from the medi-center said. They thought the examination was over, they left, with no prescription. They'll be home shortly, with her meds. I saw mom today (Sunday) when I did laundry. She is still coughing, but taking it easy. She's now been on the meds for two days, and she says she can feel a difference now. Thank God for that. Dad and Chris (my brother, who lives at home) knows the importance of making sure she listens to doctor's orders, so they'll be on her to make sure she does that. Regarding work, it appears that I will be getting a bonus, and a pay raise. Just in time, as I'm planning to buy a new car in May or June. So I get paid on Friday, and then next week (a non-pay week) the bonus will credit my account, and then next month is a 3 pay check month, so it's all just in time to go into the savings account for the car. Yes, it is. In the old view, at the bottom, I saw a list of recent posts, so, for example, if you posted something on your blog, I could go right to it without having to access your blog first, and then find the most recent post. I looked to see if there was some sort of setting adjustment I could make to get that back, but I wasn't able to find one if there is one. OK, let me adjust that. I just noticed the link to see the most recent posts, and that will work, but it's not as convenient as the old way.